You’ll sail around the shores of this magical island, constantly searching for polar bears and other natural wonders. Covering western Spitsbergen, your expedition will afford ample opportunities to view immense glaciers, deep fjords, soaring mountains and unique flora and fauna. Sailing north into Krossfjord, have your camera handy, ready to capture some of the best glacier calving in Spitsbergen. Deep in the fjord, the highly active Lilliehöök Glacier awaits. Listen in awe to the growling as big chunks break off into the icy waters below. A Zodiac excursion to nearby Ny London, an abandoned mining settlement, provides an ideal place for a guided walk. Encounters with wildlife, such as the indigenous Svalbard reindeer, are possible here. After cruising overnight, wake up to the stunning sight of the magnificent Monaco Glacier, another prolific iceberg producer. To make this even more thrilling, help your Expedition Team to scan the shorelines and ice edge for marine mammals. Possible landing sites include Texas Bar, Worsleyneset and the Andoyane Islands (where polar bears have been known to roam). At 80°N, you’ll reach a walrus sanctuary on the tiny, crescent-shaped Moffen Island. Watching from the water as large groups of these lumbering giants jockey for space is an unforgettable experience, so be ready with your binoculars. At Smeerenburg you can see the remains of an abandoned settlement that was established by Dutch whalers nearly 400 years ago. 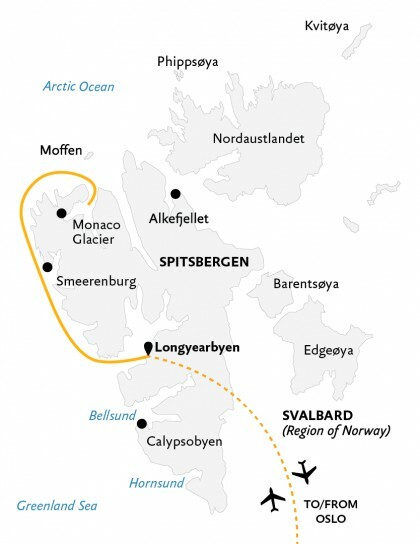 Here, at one of Europe’s most northerly outposts, you’ll have time to explore ashore and learn about Spitsbergen’s whaling history. Afterwards, cruising to Magdalenafjord rewards you with panoramic vistas of snow-capped mountains and massive glaciers reflected in the crystal-clear waters. During your last full day of your arctic adventure, you may visit the Russian mining town of Barentsburg, home of the world’s northernmost brewery. We hope to round out the day in Alkehornet, taking in the towering cliffs teeming with nesting seabirds, such as fulmars and Brünnich’s guillemots (thick-billed murres). Encounters with reindeer might be possible here too. Later, in the evening, swap stories with your shipmates and crew one last time, at the captain’s dinner.